Police officers should not use anti-terror stop and search powers to prevent people from taking photographs, the UK's counter-terrorism minister is set to tell police chiefs. Police officers should not use anti-terror stop and search powers to prevent people from taking photographs, the UK’s counter-terrorism minister is set to tell police chiefs. Section 44 of the Terrorism Act gives police officers the right to stop and search an individual ? and confiscate an article ? whether or not there are grounds to suspect a connection with terrorism, provided prior authority has been obtained. The authorisation must be confined to a geographical area and length of time. The government pledge comes as Home Office figures reveal that police in England and Wales stopped and searched nearly three times as many people in the year to 31 March 2008, under anti-terrorism laws, than the year before. And last month we revealed that photographers face wider anti-terror curbs this year. However, despite continued reports of photographers being stopped, there are currently no available figures for the number of people stopped while taking photographs, the Home Office has told AP. In total, police searched 124,687 individuals in 2007/2008, compared to 41,924 the year before. 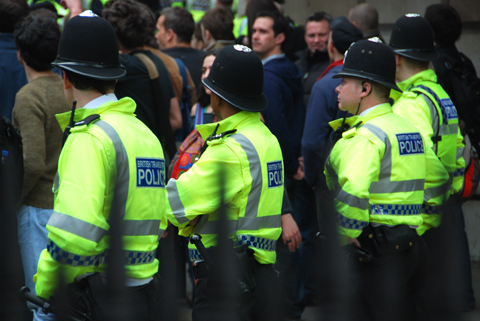 Of these 108,477 (87%) were by Metropolitan Police officers – representing an increase of 266%. Of those searched nationwide, 1,271 (0.01%) were subsequently arrested. Of these, only 73 were arrests for terrorism offences. And the number of people stopped and searched in London alone, rose to 173,220 during the 2008 calendar year, according to figures released by the Metropolitan Police and seen by AP. Though this is more than double the number of the year before, only 65 individuals were arrested for terrorism offences, according a report today by BBC London. No figures have been released on the number of people charged or convicted of terrorism offences as a result of Section 44. Meanwhile, Ministry of Justice figures show that the number of stops in England and Wales – under police ‘stop and account’ procedures during 2007/2008 – rose 26% to 2.3 million. Last month the Met told us that they use stop and account to find out what people are doing – adding that they use this tactic as a starting point to see if anything ‘untoward’ is going on. Lord Carlile, the government’s independent reviewer of terrorism laws, called on the Met to review its use of Section 44. In a statement the Met told us: ‘The Terrorism Act 2000 has been more widely used since the planting of two car bombs in the centre of London in July 2007 in order to make it harder for terrorists to operate. The statement added: ‘We recognise the sensitivity surrounding them and constantly look to improve our use of the tactic. The Met has consulted widely with stakeholder and community groups throughout this process and publishes all data on its web page. Last month we revealed that civilians are being told to be on guard for people carrying cameras and zoom lenses as part of anti-terrorism seminars being rolled out nationwide. The Home Office insists that there is no alternative as Britain continues to be on a state of high alert for a possible terrorist attack.